The Indian Sub-continent having a Colonial Portuguese in India dates back to 1490's. It was established in the territory of present day Goa, India. The present day influence of the Portugese food and culture remains historic yet strong. It has definitely left its mark on its local cuisine in indelible ink! The local language of Goa is Konkoni but many still speak the Portugese language along with English and Hindi. They have an abundant love of mixing lots of spices in their food with generous amounts of vinegar (coconut vinegar is the local staple) and chillie. Some of the most popular are pork Vindaloo, Balchao- a seafood curry or Sorpatel - a meat dish. However, Xacutti which is pronounced as Sha-Ku_Tea, is from the origins of the word Chacuti in Portugese. In Goa Xacutti refers to a blend of spices when used on chicken and lamb that creates the dish. Variations of this recipe are abundant. Over the years the Portugese themselves continue to make Chacuti with potatoes and pearl onions with a tomato based coconut gravy and serve it with white boiled rice. The Goanese on the other hand keep to it being thicker and quite different in appearance which is served with their local bread; a small crusty bun or then a nan- paratha-chapati. I enjoyed my Parsi version with a Vegetable Pallau Rice! 1 kg chicken+1 tsp salt applied all over. Keep aside until later. Heat the oil and sweat the onions until golden brown. Add the sugar to help it caramelise quickly. Add all the other ingredients as listed, stirring and browning the paste as you take a minute between adding each block of ingredients. until finally you add the coconut water. Now bring it to a boil, cover, lower the heat and cook for 25 minutes. Lastly add the chicken pieces and mix well. Cover and cook for 20 minutes if boneless breast and 40 if with bone and leg thigh pieces. Check that the chicken is cooked through. Serve this with warm fresh chapatti, naan or a Vegetable Pallau Rice. 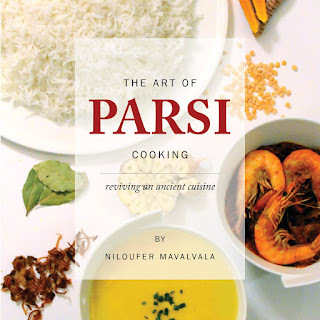 Read more about Parsi Food and its history and origins in the cookbook The Art of Parsi Cooking; reviving an ancient cuisine. If you find the grinding intense and do not have garam masala, add 6 whole green cardamoms and 2 sticks of cinnamon to the pot instead. "Toasting" the spices simply means heating them in a fry pan over a flame. The warmth releases all the oils of the dry spice rejuvenating the aroma and flavours from within the spice after storage. Using an extra tbsp or two of rice vinegar will be a substitute for the tamarind paste if you do not have vinegar. Rice vinegar has a subtle flavour. Using apple cider vinegar or other fruit vinegar is fine but can be pungent so add a little less in total. A small piece of jaggery instead of brown sugar is also a great healthy option. Freshly grated coconut is available in the freezer sections in most Indian markets. Desiccated coconut is a close substitute. Please note that the texture of this dish is NOT a smooth one. If you dislike a rough chewy texture you should not be getting excited on trying this dish. The fresh flakes of coconut are even larger than the desiccated ones which are much shorter and finer. Authentic Xacutti is made with the hand grated large coconut flakes, very similar to that used in chocolates like the Bounty!